These easy zucchini fritters are a delicious way to make use of zucchini when it starts overflowing gardens and markets near you. Simple grated zucchini gets mixed with egg and flour and cooked like pancakes. The result is tender and crispy—a perfect snack, appetizer, or light meal. Offer them up as they are with just a sprinkle of sea salt, or serve them with a spicy salsa fresca or bright cilantro-mint chutney (as pictured here) or other kicky sauce to highlight their sweetness. 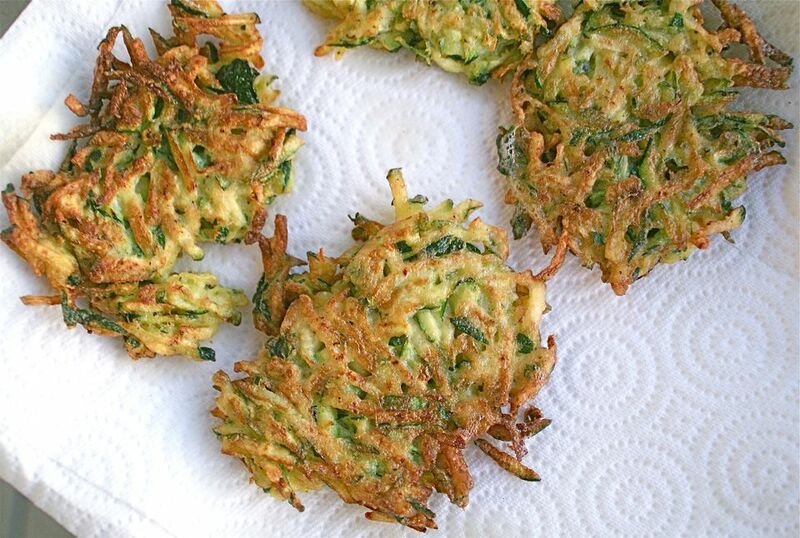 Feel free to double or triple this recipe, for more zucchini fritter fun. Grate the zucchini on a large-hole grater into a large bowl. Move the zucchini over to one side. Crack the egg into a small bowl and beat it until there is no distinct yolk and white bits. Add the egg to the zucchini and stir them together. Sprinkle the zucchini-egg mixture with the flour and salt and stir to combine thoroughly. Cover and chill for at least 30 minutes and up to several hours. Heat a generous layer of oil (about 1/4 inch deep) in a large frying pan or pot over medium-high heat to 350 F to 375 F. How do you know when it's hot enough? A bit of batter dropped into the pan should sizzle immediately; if it doesn't, give the oil a bit more time to heat up (if it sizzles and browns instantly, then the oil is too hot—reduce the heat and let it cool off a bit). Put generous spoonfuls of batter into the pan. Flatten them a bit with the back of the spoon to make fritter or pancake-shaped items. You should be able to fit about four fritters in a 10-inch frying pan at a time. Cook until the fritters are browned on one side, about 4 minutes. Use a spatula to flip the fritters over and cook until they are brown on both sides, about 4 more minutes. Go more on whether the fritters are browned and cooked through than the time since the exact temperature of the oil and the batter will vary the cooking time. While the fritters cook, line a paper plate or baking sheet with layers of paper towels. When the fritters are brown and tender, transfer them to the paper-towel-lined plate to drain. Repeat with the remaining batter. Serve the fritters immediately. If that's not quite possible, you can keep them warm by popping them in a warm oven (about 200 F), if necessary.